Never leave your child alone around water, not even for a few seconds, not even to answer the phone, door, or to get something . . . Take the child with you! Never leave a baby or toddler in a bathtub under the care of another child. Always keep an infant or young child within arm’s reach in a bathtub to support them if they slip or fall. Use non-skid decals or a mat inside the tub to prevent slipping. Use toys in the tub to keep your child busy and sitting down, and away from the faucet. Keep the temperature of your water heater below 120°F to prevent burns. Unplug all electric items, such as hair dryers and radios. Keep the floor and your child’s feet dry to prevent slipping. Prepare ahead: have towel, shampoo, wash cloth at hand before starting the bath. Have a towel ready right after the bath to wrap your baby, dry and keep warm. 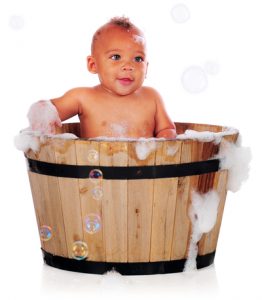 Follow the doctor’s advice for bathing the umbilical cord and how often to bathe your baby. Use warm, not hot, water. Place your elbow under the water to check temperature before putting the baby into the water. Wash your baby’s head last so that their head does not get too cold. Place a door knob cover over the outside door handle to the bathroom. Place a lid lock on the toilet seat to keep a curious toddler from falling into the toilet bowl. Never leave a tub filled with water unattended. Learn CPR – it can be a lifesaver when seconds count. Enroll your child into swim classes, commit to attending each lesson. Maintain constant eye-to-eye contact; only trust responsible adults to supervise in your absence. Keep infant and children within arm’s reach at all times when around water. Do not use bath seats, flotation devices or swimming ability as a substitute for adult supervision. Install door & window alarms that access to pools, spas and all other bodies of water. Empty & put away smaller portable pools after every use. When the pool is set up, ensure proper adult supervision. Fence portable pools & encourage your neighbors to do the same. Cover larger portable pools and safely store access ladders away when adults are not present. Never leave a bucket of water unattended. After using a bucket of water/liquid, empty immediately & store out of reach. Buckets left outside can collect rainwater and become a hazard. Use safety latches for toilet seats. Empty water from sinks, coolers, pails and containers. Be aware of leaky faucets that might allow water to accumulate and pose a risk. Beware of decorative ponds, fountains, septic tanks & washing machines.